This page... wow, this page was the worst pain to finish ever. Between laying it out, the backgrounds, the crowds... never want to do that again. The song on the loudspeaker is Jonathan Coulton's "When You Go," quite possibly the saddest song in human existence. Go buy the mp3; it's phenomenal. Have a great week, guys and gals! See you on Friday! Rich is quite a guy, aint he? Here is hoping he gets hit by something big, ugly, and doing 60 mph. This looks like it was a tough page alright. Imagine having to color it too! 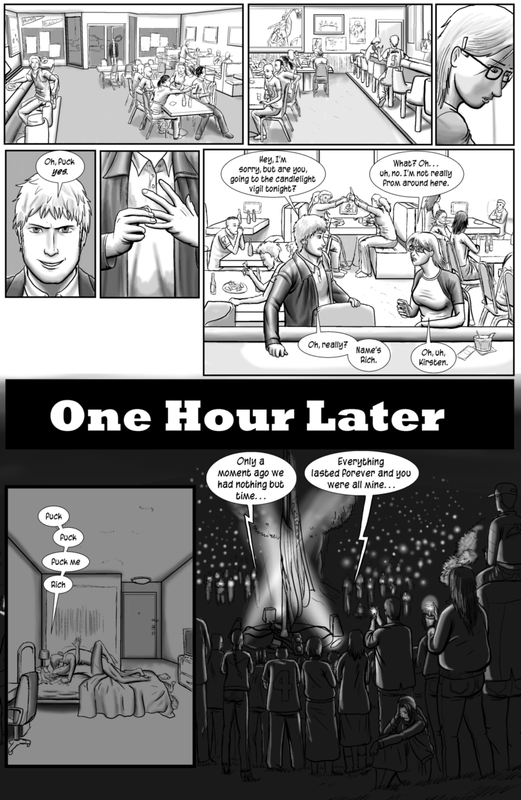 Also, I think I'm going to print this page out and show it to people when they ask me why EverydayAbnormal is in B&W. The page looks absolutely amazing and was definitely worth the effort. Good point. My apologies to all dicks! Wow! The crowds and detail on this was well worth the effort! It looks amazing!